Is the banner printed as one piece? Be wary of companies that offer inexpensive, multi-piece banners. Their banners are often stitched together after printing, creating visible seams that not only look messy, photograph poorly, but also limit the reuse of the banner in the future. At StepRepeat.com, our banners are printed as single pieces, free of any unsightly seams which interrupt the flow of the printed image. 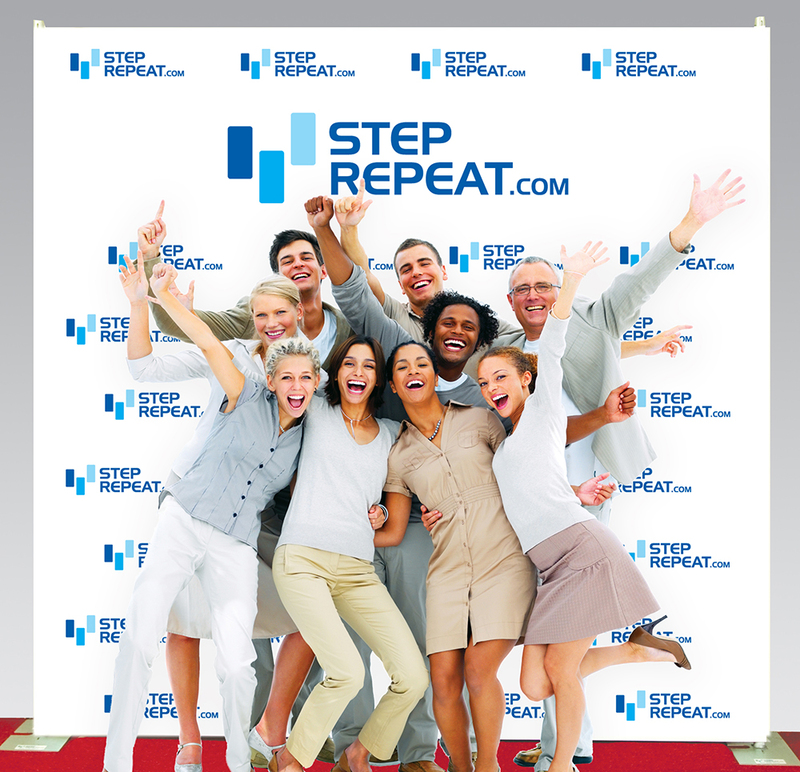 Where will your Step and Repeat Banner be displayed? StepRepeat.com offers printing formats tailored to your specific needs. If being used indoors, our premium Non-Glare Fabric is the perfect option. If your banner will be placed outside, our Premium Block-Out vinyl is ideal, as no light can pass through, eliminating shadows and creating ideal photographic conditions. Regardless of placement and time of use, we have an option to suit your needs. Our banner stands are engineered with the user in mind. Setup is simple, and instructions are provided. Made from aluminum and steel, and fitted specifically for our banners, the stands are more durable than the telescopic stands sold by some of our competitors. They come with a 10 year warranty and parts are available if needed. How will the Step and Repeat be packaged? All Step and Repeats are rolled on a piece of PVC pipe and wrapped in plastic. They are never folded. Folding creates creasing in the banner that may never come out. Our "5 Minute Setup" and "Quick Setup" systems are packed in a durable vinyl carrying bag and shipped in a custom made box. 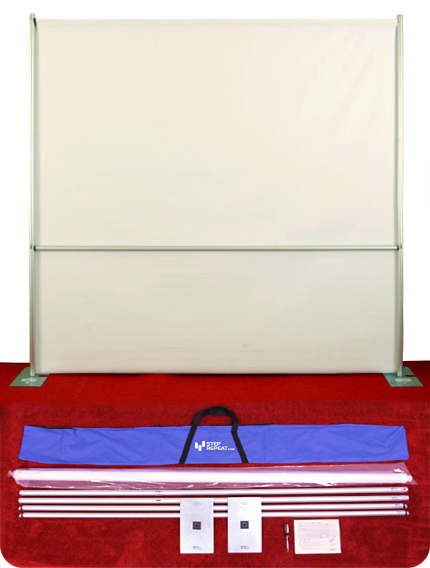 This insures your Step and Repeat will arrive in good condition, and can be stored conveniently for future use. From design to packaging, everything is done in-house. Our sales and design team share space with our finishing team and communicate constantly to make sure your banner looks and functions perfectly. Will the banner look like the examples shown in the Gallery section? Absolutely! 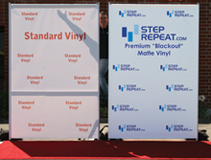 All images on our site are of products printed and assembled by Step and Repeat staff. 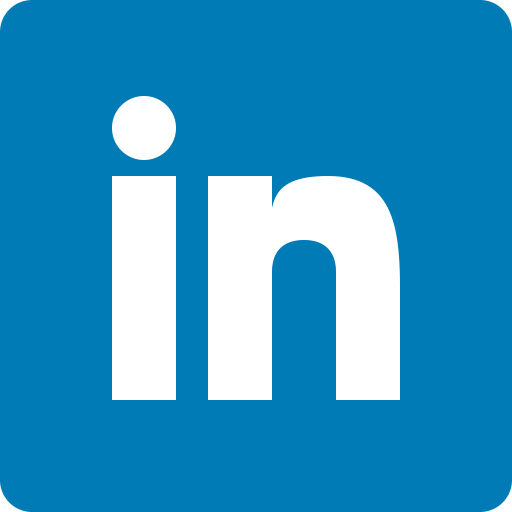 We are constantly innovating and streamlining to provide the best possible experience for the user.